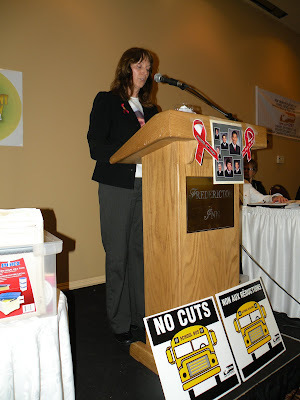 Isabelle Hains speaks at the CUPE 1253 Annual General Meeting in Fredericton, NB, May 6, 2010. 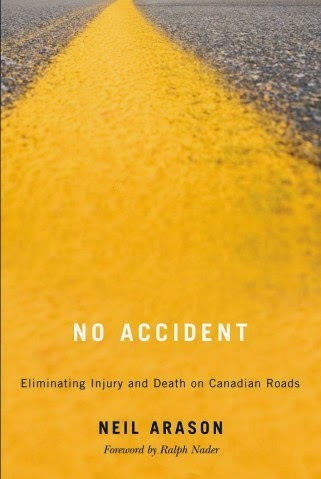 A Bathurst mother who lost her son in a van crash in 2008 that killed eight people is pleased Transport Canada has launched a safety review of 15-passenger vans. "It means that they're taking it seriously, that children who travel in 15-passenger vans are not safely protected in those vehicles when there's an intrusion, or an impact, or when they're heavily loaded," Isabelle Hains said Wednesday. 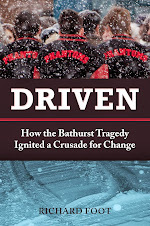 Her son Daniel was one of seven high school basketball players killed when the 15-seat van they were travelling in collided with a transport truck on a snow-covered highway just outside Bathurst on Jan. 12, 2008. The wife of the coach was also killed in the crash. Within days of the accident, New Brunswick banned the use of the vans by schools. Hains has been lobbying for more safety regulations for student travel since shortly after her son's death. Federal Transportation Minister John Baird announced this week that the government will study the vans. "Now the government is taking the initiative and an important step for children's safety in schools across Canada," Hains said. Last month, the NDP MP for Acadie-Bathurst, Yvon Godin, introduced a private member's bill to impose a national ban on 15-passenger vans. The vans are banned for student transport in New Brunswick, Nova Scotia and Quebec. Hains said she hopes the safety review is done quickly, and that a national ban on the vans follows.